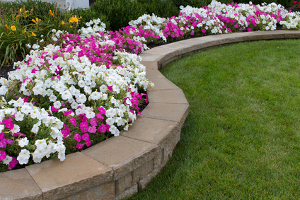 Huntsville landscape edging has become an increasingly popular choice for tasks like landscaping and gardening. Both bricks and rocks are common landscaping or hardscaping choices that offer a classic but budget friendly option for creating a stunning look. However, it is important to work with trained and experienced professionals who know what it takes to work with these materials and have the best results. It is easy to get creative with these materials; you can use the same material in a thousand different lawns and never have the same, exact look. Brick or rock edging offers many advantages beyond the traditional look and feel so many homeowners desire. As sturdy and durable as these materials both are, you can also feel confident that either of these options will last for years to come. Another reason these materials are so popular is because they are known for being affordable. As with most building or hardscaping materials, Huntsville brick landscape edging comes in a variety of types. Lower grade bricks used for edging generally come in redy clay or plastic. The middle grade of this material includes options like resin bricks, recycled bricks, poured concrete and so much more. And the highest grade bricks are clay with decorative edging or those which are designed to look like pavers. With so many great possibilities, the only thing you need to know is how our Huntsville landscapers are going to work many of these great options into your yard. So what are some other benefits to opting for Huntsville landscape edging as opposed to other types of features? For one thing, this is one of the least expensive materials to choose. Plus, since they last for such a long time, you get more bang for your buck without having to worry about replacement for years to come. This really is a way to help make a landscape design look completed as opposed to unfinished. 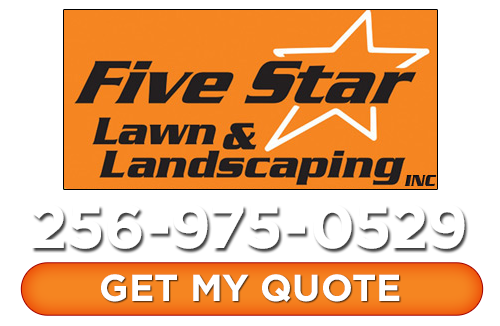 So if you are ready to find out more about what Huntsville brick or rock edging can do for you, contact the Five Star Lawn and Landscaping, Inc. crew today. If you are looking for a professional Huntsville landscaping edging service then please call 256-975-0529 or complete our online request form.